It has been a while since I sent our last newsletter and lots have been happening here at Spies Publishing! It's always hectic when you launch a new book and try to get it out there. But I'm happy to say that we have been receiving some great reviews for Ben's latest book - The World of Greek Mythology! I'm sharing a few below in this letter. Check them out. Ben also had a small feature in The Week Junior Magazine from the UK, where he shares his love for books and writing. He is extremely happy about it as it's one of his favourite magazines and he's been a subscriber for a few years! If you've been following our Facebook page you would know by now that Ben is writing a new book! Yay! And we need you! Yes, we need some advance readers to read the book before anyone else (yes, you will have it first!!) and let Ben know what you thought of it - a true feedback that Ben will take into consideration and may accept your ideas before publishing it! And last, but not least..... I've ALWAYS wanted to help other children to have their own books. Just like what I did for Ben. I have been approached by many parents asking if I could publish their children's stories too. And I'm super excited to say we now can!! Keep reading to find out how your young author can now have their own book! The World of Greek Mythology? Click on the images below to check the reviews out and if you like what you read, head on to Amazon to buy the book! GIVE AWAY TIME!! HAPPY EASTER!! Head on to our page here to be in to win!! Easter Giveaway - chocolate and books!! Yum! events, workshops and new books! Nice to see Ben sharing his love for books and his passion for writing with the British readers! If you're in the UK, The Week Junior is a brilliant current affairs magazine for children aged between 8 and 14. It’s filled with fascinating stories and information, written to engage curious young minds and encourage them to explore and understand the world around them. Would you like to read Ben's next book and give him your feedback before we publish it? Email us at: info@spiespublishing.co.nz to let us know you want to be one of Ben's Advance Readers! You will receive his manuscript by email before it goes to print and you can let him know what you thought of his book. Helen and I made a video to introduce you to MY FIRST BOOK. At Brain Bunny Workshops, the classes are focused on teaching kids how to write creatively. They instill a love of story telling, rather than focusing on spelling and grammar, helping children gain confidence in their creative writing skills. If you would like to know more about Brain Bunny Creative Writing program for your child, click here. We are so happy to be part of Booktown Featherston again this year!! Come and join us and lots of other New Zealand publishers and authors in this amazing event in the Wairarapa. There will be something for everyone in the family. And books! Lots of books! Check their program here. If you haven't seen us in Instagram yet, click on button below to follow us! ​Hello all and welcome to the final Spies Publishing Newsletter for 2018. I hope this finds you well and that you're all looking forward to a lovely summer holiday with friends and family. I would like to say a HUGE thank you to all of you who came to our book launch for The World of Greek Mythology. It has been a labour of love over the past year and Ben and I were extremely happy to be able to have shared it with you. We have already been receiving emails and reviews about the book and with some of the readers asking when Ben's next book is coming out! So thank you, thank you and thank you for your kind and generous support this year. Some pictures of the day below. I just wanted to finish wishing you and your family a wonderful Christmas and a Happy New Year filled with love, peace, health and lots of reading! Our Book Launch for "The World of Greek Mythology" was a combined event with author and children's tutor Helen Vivienne Fletcher, who was also launching her latest book - "The Trespassers Club." Helen was also the editor for Ben's book. and order your books for this Christmas. (But be quick as NZ Post cut off date is on the 18th December!!). visit her website at: www.helenvfletcher.com. Thank you Kapiti News for covering the Book Launch event. And also Radio Coast Access for the awesome interview with Ben. Huge thanks to the team at Grapevine Magazine and Capital Magazine for featuring our books in their issue this month. Check out both magazines below with links on where to get them. "The Magic Pencil" was part of a giveaway in Grapevine and Ben's new book - "The World of Greek Mythology" was in Capital in their Christmas issue. Both magazines contain great articles to entertain, inform and delight you these holidays! We are running an awesome giveaway at the moment on our Facebook page! (until Sunday, 16th December). Head to Spies Publishing to enter the giveaway. We will be giving away Ben's three books, a copy of Capital magazine and some chocolates. Yum Yum! We are taking bookings for our workshops for next year! If you have an event or holiday program and would like to have us, send us an email. We will be away for most of January, but we have one workshop scheduled at the Roxy Cinema, Miramar, Wellington on the 24th January. You can book a space here. We are also taking bookings for school visits. We have a new program for the schools, so please get in touch here. Big thanks to the teachers at Boulcott School for having us last term. Welcome to our new retailers Paper Plus Wanaka in the South Island and Dynamo Kidswear and Gifts on the Kapiti Coast, who are now stocking our books. You can see a full list of our retailers and bookshops on our website. We were extremely honoured to have been invited to the launch of Marie Munro's new book - Bella's Fringe - a beautiful picture book. This humorous story about Bella's hair continues with the search activities in te reo Māori that appeared in "Nana's Shed” and extends the counting in English and te reo to 20. A great gift for this Christmas. You can get a copy of Bella's Fringe here. If you would like to order our books through our website, remember to quote code: FREEDEL at check out to get free delivery. Our pre-launch OFFER is also still on! 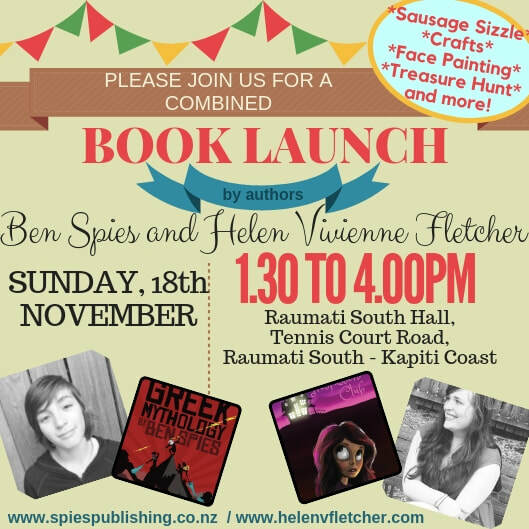 Twelve-year-old Kapiti author Ben Spies and children’s author and tutor Helen Vivienne Fletcher from Wellington join forces to launch their books in a fun filled, family friendly event celebrating young talents. Many twelve-year olds love to read novels, but not many can say that they have written and published their own. Ben Spies’ debut book, “Weirdo”, was written when he was just nine years old. His second book, “The Magic Pencil”, followed soon after at age ten, and at eleven the young author wrote his third book, “The World of Greek Mythology”. Ben says he has no plans of stopping there. Helen Vivienne Fletcher is a children's and young adult author, spoken word poet, playwright and creative writing tutor. She's published two young adult novels - "Broken Silence" and "Underwater" - a short story collection for adults, and three picture books for children. Her latest book, "The Trespassers Club" is her first mid-grade novel. The combined Book Launch will take place on the 18th of November at the Raumati South Hall, in Tennis Court Road, Kapiti Coast, between 1.30pm and 4pm. Guests will have the chance to ask questions, chat with the authors, or get their books signed. There will also be face painting, crafts, a treasure hunt, colouring-in competition and a sausage sizzle. If you love Greek mythology, or you’re keen to learn more, this book is sure to delight and captivate your imagination. Laura has always spent her free time playing Trespassers Club with her sister, Katy. But Katy just turned thirteen and isn’t interested in playing games anymore. When their family moves suburbs, Laura discovers an old abandoned house on her street. It seems like the perfect hideout, but something – or rather someone – is already hiding inside. Will Laura get herself into trouble if she gets involved? Kia Ora and welcome to the Spies Publishing Spring Newsletter! Click on button below and order it now! We will let you know when is out and ready for shipping. Our workshops are back for this school holidays! Thanks to all the venues that hosted us during the last school holidays. We had a great time at the Upper Hutt Library, Lower Hutt Library, Ngaio Library, Waikanae Library, The Roxy Cinema, SKIDS holiday program, Kapiti Community Centre and the Writers Plot Readers Read bookshop event. It was great to meet so many of you. We had loads of fun and we're very humbled with all the feedback we received. Thank you! Here are some of them: “It was cool, interesting, fun”; “It was really interactive”; “It was soo awesome!! !”; “Great tips from Ben & his mother”; “Great event, kids loved it!”; “Very well organised, well planned, fun & worthwhile”; “I enjoyed hearing his personal experiences during the making of the book”; “I learnt different ways of writing”. Happy Anniversary to us!! We are celebrating our two year anniversary!! Plus we are offering FREE shipping on any orders this month on our website! Head to www.spiespublishing.co.nz and type FREEDEL at check out and we will ship your books for free! For our subscribers outside New Zealand we have a great announcement to make! We have partnered with online retailer BOOK DEPOSITORY to bring you The Magic Pencil and Weirdo with FREE delivery anywhere in the world!! Thank you for reading and we will be in touch soon with a date for our new book launch! ​After a fast-paced, jet setting career in the hotel industry, Renata Spies came to New Zealand with her husband and kids for a very different lifestyle. She has no trouble filling the day, though. 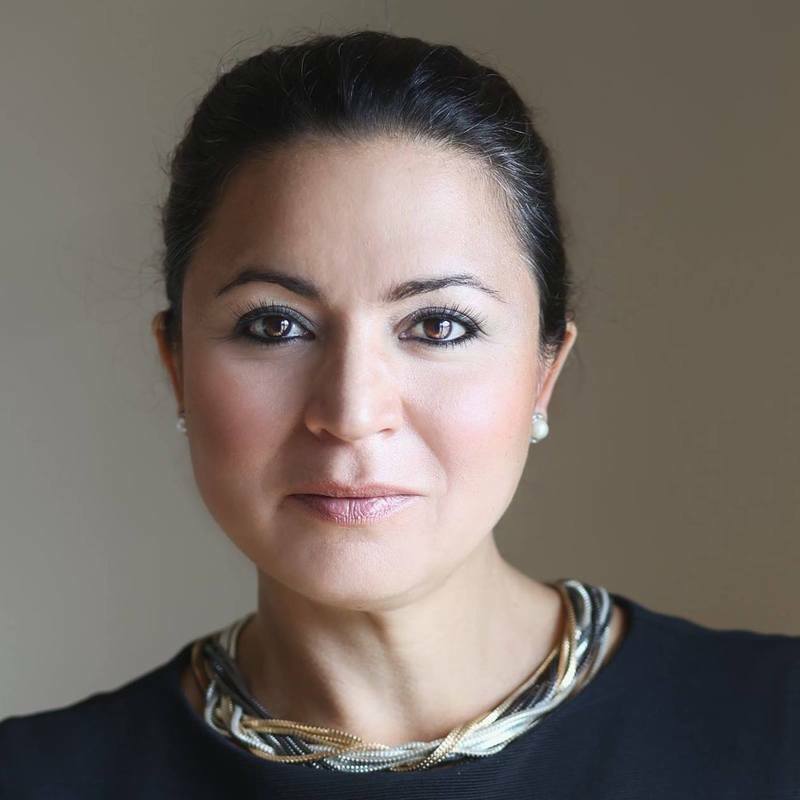 The founder of Spies Publishing talks about publishing her 12-year-old son Ben’s books and why she stepped out of the traditional workforce to be a full-time mum, and passes on her Nana’s sage parenting advice. F&R: Hi Renata! Tell me about becoming a parent. Renata Spies (RS): I was backpacking in Europe when I was 26. I had the time of my life and learned English; I’m Brazilian and English is not my first language. I met my husband, Robert – and I never went back to Brazil. We got married and started a life together in London. When Ben was born, the idea was I would keep working full time. I took six months at home and I really wanted to go back to work. I was with Marriott Hotels, overlooking the European Asian market for incentive marketing. I was travelling a lot – our head office was in Washington – and I had a nanny at home looking after Ben. It was what I wanted to do; my dream career. But one day, he walked for the first time – and I missed it. I started thinking, what’s more important for me now? Is it being with my child or having this career? It really surprised me that I wanted to be a mum, because since I left university I had this image of me as a career woman and working a lot. But now, being a mum is my main goal. I try to do the best I can – it’s a very hard job! Ben was two when I stopped working and we came to New Zealand. It’s the perfect place to raise a family. There’s so much to do with kids and I think the government understands that you should be with your child for the first years and give all the tools for that. Daniel came four years after Ben. He’s 8 now and Ben is 12. F&R: These days, you have more of a portfolio career, right? RS: When Daniel started kindy, I thought ‘what now?’ I didn’t want to go back to the office because I still wanted to spend time with them so I decided to start my own events business. It was great because it showed me I should be networking. I put myself out there, enrolled in workshops and met all these businesswomen. Three years ago, I started Kapiti Women’s Expo, to show the community what this group of women is doing. That was growing for two years. It coincided with starting the publishing business so I decided to sell this year and pass it on. Time management is one of my everyday challenges. Everyone’s struggling with that. At the Expo, I made sure one of the talks was about parenting. The speakers always went back to look after yourself first. If you don’t look after yourself, you can’t look after your family. F&R: What does that look like for you? RS: Every morning I go for a walk after I drop the kids off at school. I do a bit of yoga and I have my time that’s just for myself. And then I start my day. I know I have between 10am and 2pm to work; that’s four non-stop hours for my business. I’m so glad that lots of companies nowadays are more flexible with mums and dads. They’re really seeing that your capability isn’t just available within office hours. You can work from home, or work in the evenings, and be as good as if you’re in the office; you still deliver but in a different way. My husband Robert works for New Zealand Post. They’re really flexible. It’s good that he can have that flexibility; you have to work as a team at home as well, parenting together. F&R: What’s the story behind Spies Publishing? RS: It started with Ben writing every day when he came back from school. I would see him on a lonely journey in front of his computer, just writing, and I didn’t know how to reward or recognise it. He wrote his first book Weirdo when he was 9. I had it published and I gave it to him as a gift. He hasn’t stopped writing since. I think he writes so much because he reads so much. Reading a lot gives him a great imagination. Children are so authentic in their thoughts and so funny and imaginative in their stories. It’s a whole new world for me – I’ve never been in publishing before. When I started, I didn’t even know there were three edits; the structural edit, the copy edit and the proofreading. The most recent book, The Magic Pencil, had these three amazing editors. I found the best I could afford in order to have a really good quality of work. It didn’t take me long to realise I can do this; what I need is a great team of editors and designers to make me a good product. I’m learning as I go but I’m really excited. I hope we can inspire other kids to read more and write more. We need to really reward, recognise and nourish children’s writing. F&R: You’re from Brazil and your husband’s from England. Even with technology, it can be incredibly difficult to build a relationship between children and their grandparents when they live in different countries. How have you dealt with that in you family? RS: It’s amazing what technology can do. But there’s really nothing like grandmother’s cuddle and sitting down on the floor and playing with them. It’s not just the grandparents; it’s the extended family as well. We just came back from San Francisco. It was a family reunion with my sister and her family. There were seven children, all the cousins, all playing together. We try as much as we can to get together; I don’t want my children to grow up with no memories from family. F&R: Last question: what’s the one piece of advice you’d pass along to new parents like me? RS: I’m going to tell you what my grandmother told me when I was pregnant. She said babies need fresh air every day. So when I had Ben, I would go out with him every day to get fresh air. And then I realised it was for me! It’s not for the baby! My clever Nana, she knew! She died before I could tell her, but she knew I had to get out of the house and meet friends and go to playgroups – otherwise you can go crazy! So that’s my advice; just get out of the house every day and have some fresh air. Check out Ben’s books, Weirdo and The Magic Pencil at Renata’s company, Spies Publishing. Hope you are all keeping warm with the arrival of Winter in New Zealand and the ghastly cold weather! But it's also great to see the sun making its appearance on the upper side of the Hemisphere. Thank you for all the new subscribers this month from that side of the world. Enjoy the sunshine! Some of you might not know that Spies Publishing was born from our son's love for writing! Ben started writing since a very young age and as a mother, I followed his lonely journey for many years not knowing how I could reward or recognise his passion for writing. Until when he was 9 years old and I decided to publish his first book - Weirdo - and give to him as a present. I organised an amazing book launch for friends and family at our local library. The book was more than a gift for Ben. Since the launch, he's never stopped writing and his stories became funnier and more interesting which led me and my husband to take the plunge and start Spies Publishing - an independent publishing house creating children's books actually written by a child. We have so many exciting ideas for the future, but I like to always go back and remind myself 'why' we started this business - to reward and recognise our son's passion for writing. And this is what we want to do for other children too. Recently I started running workshop to give other children the opportunity to also create their own books to take home and be proud of their writing. It's been an honour to meet hundreds of young writers in our workshops and I would love for you to join us at the future ones we have organised for this school holidays. Check date and locations below. Thank you so much for being part of our journey and keep in touch. Our workshops have been a great success and often booked out quickly. If you are looking for things to do this school holidays for the kids, check the dates and locations below and write down in your diary! We have a great line up of events and would love to have you there, including the "Beyond the Page" promoted by Wellington libraries. Our books can be found in a selection of bookshops around New Zealand. Welcome to our new bookshops: Take Note Tawa and Books for Kids in Hamilton. Thank you to everyone who participated in our latest giveaway. The WINNER was Kim Corley . Thank you, Kim. Hope you're enjoying all the reading and the chocolate! Like our FACEBOOKpage to see our events and giveaways! And if you prefer INSTAGRAM, you can follow us HERE. We had such a great time at the fantastic Booktown Featherston this year. Our workshop held over 30 children!! Wow! Thank you to everyone who came and enjoyed it. It was awesome to see so many young writers in the make! Awesome to receive the reviews below and mention in the media. Thank you! Thank you to all the media who had us featured recently. It's great to have our books reviewed and shared with young readers. Ben also did a great interview on the Australian radio station - Switch On Radio. Isn't the year going by really fast? It's Autumn already and Easter time! Happy Easter! We at Spies Publishing are absolutely over the moon with the decision to re-launch our first book - Weirdo! As you know, Weirdo is very special to us as it was Ben's first book. Ben wrote it when he was only 9 years old and Robert and I decided to give to him as a present - a reward for his passion for writing. We put it together ourselves and gave to him as a surprise. I will never forget that day. Spies Publishing was born. The rest is history... So, it is with much delight that we announce the re-launch of Weirdo, designed - interior and cover - by the same designers who worked with The Magic Pencil. The book is with the printers as I write this letter, so it will be out very soon! Check the new cover below. We LOVE it! ​Our Press-Release for the re-launch of Weirdo was out this week in the newspapers across the Wellington region. Awesome stuff! Summer is such a great time to go out with the family and enjoy the many festivals around the country! Last month we were lucky to be part of two major festivals near us. We delivered our workshop - "Create Your Book' at Coastella Music Festival in Kapiti and the Just So Festival in Kaitoke Park, Upper Hutt - an extraordinary event combining art, music and literature for children and their families. Super fun! Thank you to everyone who came by. We had some amazing feedback from the children. Thank you. We also would like to thank Johnsonville Library who hosted us for our workshop and Palmerston North city libraries who hosted us to present the workshop to their Summer Readers programme participants. It was lovely to be there! Spies Publishing has partnered with a few venues to bring to you our 'Create Your Book' workshop. We would love to have you there! events and get all the information you need for our workshops! If you love reading e-books, The Magic Pencil is now available from a few online retailers. Click here to select your preferred provider. Or order online from our website. Summer is here and not long until Christmas now! A huge welcome to our new retailers in the Wellington region - Almo's Books in Carterton and Arty Bees in Wellington City. We've been working hard and will be adding new stores in 2018 so it will be easier for you to access our books. You can see our locations by clicking here. And remember, you can order our books from our website too! This month, we have been featured in the Wairarapa News and Stuff.co.nz with an article about Ben's passion for writing and the workshop that we gave at the Big Book Bash in Carterton, Wairarapa on the 2nd of December. You can click on the link below to see the full article. The “Create Your Book” workshop started as a desire to reproduce what I had done for Ben when I published his first book - Weirdo. An initiative to reward and encourage his writing. When children create their own books and take them home, they feel proud and recognized. They also have a beautiful book to remind them of their achievement forever. We have been visiting libraries with the workshop and have been overwhelmed with the feedback from parents. If you would like us to come to a library near you, check out our website for more information here. I also would like to take this opportunity to say a heartfelt thank you to everyone who has supported us this year, including readers, distributors and retailers. We're planning an awesome 2018 and it's a privilege to have you on board. We were so happy to receive this review from The Booksellers website! "Full of imaginative scenarios, this is a children’s story written by a child and as such features much of the things they love – action, narrow escapes, good guys and bad guys, and lots of high energy!" We had an amazing day in Auckland for the NZ Book Festival. Thanks to everyone who came and saw our stall and thank you to the organizers. We had so much fun with our school visits recently. We spent one full day visiting three schools in Wanganui! Thank you for having us - St Johns Hill School, Durie Hill School and Churton School. We visited Wanganui for the first time as a family and had a great time at Kowhai Park. We are super excited to be part of this amazing festival coming to New Zealand for the first time in February 2018! This will be a family event not to be missed! And last, but not least.... we're working on a new edition for our first book Weirdo! We've hired the same designers from The Magic Pencil to re-design Weirdo with all the cool fonts and elements that our young readers love so much! Watch this space. We will publish the new edition in the New Year! The Magic Pencil was launched a few months ago, but we're loving this Press Release written recently. Enjoy. Many eleven-year olds love to read novels, but not many can say that they have written and published two of their own. Ben Spies’ debut book, Weirdo, was written when he was just nine years old. His latest book, The Magic Pencil, has just been published and the young author says he has no plans of stopping there. Inspired by the latest generation of comedic fiction authors for young readers, such as Andy Griffiths, David Walliams and the Tom Gates series by Liz Pichon, Ben says he aims to make his peers laugh. Ben’s passion for creative writing showed through at an early age, and his parents Renata and Robert Spies did everything they could to encourage him. When he showed not just creativity, but the dedication to complete a 54 page story at age 9, the Spies took the plunge and had Weirdo published in 2015, with illustrations by his Dad, Robert. Renata Spies says the book’s popularity took them all by surprise. As well as classroom visits, Ben and his mum also host ‘Create Your Book’ workshops at libraries around Wellington designed to inspire more young Kiwi authors. While Ben’s books are still a labour of love for the Spies family, the young author says he’s been energised by some personal encouragement from one of his literary heroes.